Creatine is required for physical and mental exertion and is especially important when physically training for strength and muscle gains. 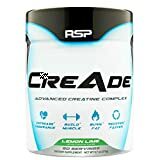 RSP Nutrition CreAde is an advanced Creatine complex powder, designed to help increase endurance, build muscle, burn fat and recover faster. 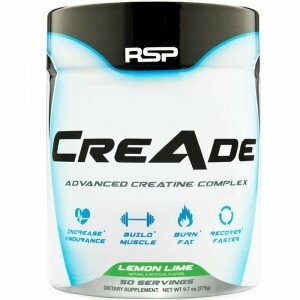 CreAde has 5 types of Creatine and contains an extra cellular peak form of ATP, and absorption blend. Its unique absorption blend is made up of L-Arginine HCL, Glycine, and Methionine; which act as transport agents, that drills Creatine into muscle cells for optimal absorption and maximum ATP production, that deliver powerful energy to the body. The 5 Creatine blend is composed of Creatine Monohydrate, Tricreatine Malate, Creatinol-O Phosphate, Creatine Magnapowder, and Creatine Pyruvate. This specific Creatine blend ensures maximum utilization throughout training which causes an increase in strength, size, and recovery. It comes in three flavors, grape, lemon lime, and unflavored. You can find all flavors on Amazon.com. Grape for $36.37, with prime shipping, unflavored for $29.99, and lemon lime for $37.11. The powders have 50 servings per container and one container is 275 grams. One serving size/scoop is 5.5g, which contains 4,000 mg’s of the Creatine blend. Take one scoop in 6-8 oz of water before exercise and take one scoop after exercise. Optimal absorption without the need for a loading phase. Contains Peak ATP® (Adenosine 5′-Triphosphate Disodium). Tastes like Gatorade and has a very good taste. Unique absorption blend that increases absorption of the creatine blend that is not seen in many similar powders. The CreAde™ Creatine Matrix contains five forms of micronized creatine scientifically arranged for maximum bio-availability and absorption. It’s three flavors are reported by customers to taste delicious and very similar to Gatorade. For many, taste is enough to completely stop someone from using a powder. Many customers mix it with workout shakes and feel very satisfied with the flavor and texture. No grittiness is reported and has a smooth texture. Customers typically report to feel increased strength after taking the powder, some even lifting up to ten more pounds. Some customers say they have no water retention from the creatine, which is a very common complaint with other creatine powders in general. There are also reports of feeling an increase in energy and see noticeable muscle gain after a few weeks of using the product. Peak ATP®, Adenosine 5′-Triphosphate Disodium, makes this product very unique. On a basic level, peak ATP is a scientifically engineered extra cellular ATP. Meaning, when muscles are being exhausted and fatigued during intense training sessions, Peak ATP kicks in when the ATP in your muscle stores are depleted. This means you can maintain peak energy and power throughout training without dropping off or burning out. Customers say that CreAde has a bad and almost sour smell to it, but that once it mixes, it tastes like Gatorade. It does not mix perfectly and some residue can fall to the bottom of your cup. This product has 5 types of creatine, but one of the creatines absent from CreAde that is found in other powders, is creatine hydrochloride. Creatine hydrochloride is believed to be better absorbed, provides faster saturation, and causes less bloating than regular monohydrate creatine powders. Chemically, they are not much different if you are to take the same product, in tablet form or powder. However, tablets carry a higher price per gram. Although, some feel tablets are more convenient to carry around and you do not need to worry about mixing it with another liquid. Powders do have slightly better absorption than tablets because the absorption is increased when the powder is mixed in with a sugary beverage, due to the increased insulin levels. Overall, CreADE is a quality product, with unique components, and a reasonable price tag. Even with some of the downfalls, like not containing Creatine Hydrochloride. However, it is theorized that even though Creatine Hydrochloride causes faster saturation, once you reach that saturation, any type of Creatine will keep you saturated at the same level. So this may or may not be as important to some people who enjoy that type of Creatine. Regardless of the Creatine Hydrochloride factor, which is theorized to provide better absorption and less bloating, the five types of Creatine in combination with the absorption blend and Peak ATP provides the same effects and arguably better benefits. The CreAde transport mix, which is the blend that helps absorption of the Creatine, is a very specific blend that is not in any other Creatine powders. The transport mix is part of why customers report feeling increased energy, strength, and muscle gains. With the reasonable price range of $29.99 to $37.11 (flavors vary in prices),the benefits of a unique absorption blend (CreAde Transport Mix), Peak ATP, and the 5 Creatine blend, outweighs any of the negatives. Similar Creatine powders in price and functionality can be worthwhile, but they do not have the transport mix or Peak ATP, which makes CreAde powder valuable and a bargain at its relatively cheap cost.